Justin Boyles, an Indiana State University doctoral student in biology, has co-authored a paper on research into White-nose syndrome that proposes a way to possibly save bats through heat. Boyles and his co-author Craig Willis, of the University of Winnipeg published their simulation findings and proposal in Frontiers in Ecology and the Environment e-View. Since the discovery of White-nose syndrome in 2007, hundreds of thousands of bats have died in northeastern United States. Scientists do not know what is causing the disease or how to cure it. 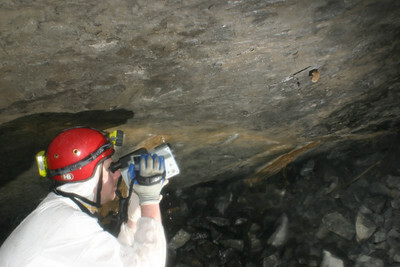 Bats hibernating in caves in New York, Connecticut, Massachusetts, Vermont, New Jersey, West Virginia and Virginia have been affected. Boyles and Willis have suggested providing localized heat sources to the hibernating bats. Boyles and Willis suspect that the fungus causes bats to spend more time out of hibernation than they would otherwise during the winter. When they rouse, the bats must use body energy to keep warm; yet too much time out of hibernation may deplete batsÃ¢â‚¬â„¢ fat reserves and cause them to starve to death. Boyles and Willis created a mathematical simulation to test the idea using patterns of arousal, body mass and percentage of body fat of the little brown bats Ã¢â‚¬â€œ a species decimated by the syndrome. The simulation showed bat mortality observed in affected populations in the wild are consistent with spending time out of hibernation. The researchers reasoned that one way to help the affected bats is to provide them with a heat source so they do not have to create as much body heat when they rouse. Bats often fly to the warmest part of their caves during bouts of arousal. Boyles and Willis altered the simulation to include localized heat sources where the bats could gather during bouts of arousal from hibernation and the model showed the mortality levels dropped to 8 percent. While heat sources would not cure White-nose syndrome, they could be used to help keep bat populations from being further decimated by the disease. They are developing a system using wooden boxes and heating coils to create warm pockets in bat caves while still keeping the cave cold enough so bats can lower their body temperatures during hibernation. Whitaker said many researchers now think the cause of the disease and eventual deaths is a fungus and researchers at the National Wildlife Heath Center in Madison, Wis., are investigating that possibility. Whitaker along with Kathleen Dannelly, ISU associate professor of biology, and Angela Chamberlain, an ISU biology research assistant, also are investigating a possible cause of the syndrome. They have found chitinase-producing bacteria in the digestive tracts of bats and the bacteria helps the bats digest the chitin throughout the year. The ISU Bat Center also has collected funding from various sources to help determine the cause and find a cure. To date, the center has collected about $20,000. Ã¢â‚¬Å“Much more is needed,Ã¢â‚¬Â Whitaker said. The center has given $4,720 to the National Wildlife Heath Center to provide one of the three refrigeration units for studies on the fungus believed to be related to the syndrome. The New York Department of Environmental Conservation received $5,000 for an automatic counter to help in counts of bats in numerous caves and mines at the same time. Donations may be made to the ISU Foundation with a notation for the Bat Center or by sending it to John O. Whitaker Jr., Department of Biology, Indiana State University, Terre Haute, IN 47809.